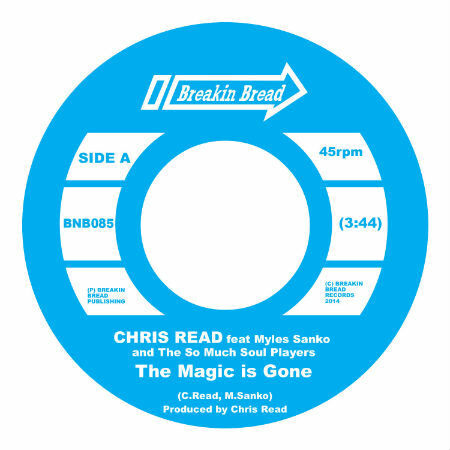 Chris Read returns on Breakin Bread with a slice of uptempo vocal funk dancefloor magic, marking his fifth 7inch single for the label. Ever exploring new territory and showing his versatility, Chris follows his 2013 throwback rap smash “Rap Tradition” with a pacey Hammond funk number aimed squarely at the dancefloor. “The Magic Is Gone” is a gritty funk number full of live energy, this track showcases the growth of Chris Read as more than just a producer. Featuring Speedometer vocalist Myles Sanko, this tune delivers a soulful vocal over an energetic drum break underpinned with a funky b-line and topped with catchy horns, memorable guitar licks and a killer Hammond solo courtesy of collaborators The So Much Soul Players (named after Chris‘s London Funk & Soul night). In what is now becoming a Breakin Bread tradition and a nod to many classic 7”s of yesteryear, the flipside features an instrumental edit. The “Hammond Reprise” follows in the footsteps of the A-Side, replacing Myle‘s soulful vocal with the throaty Hammond which dominates the second half of the original version to create a full pace Hammond work out, topped with crowd rousing vocal ad-libs. The digital version also features an instrumental mix and a great remix from Germany’s Renegades of Jazz.